Classes for children ages 5 and up focus on reinforcing the rhythm of a healthy lifestyle and honing the skill set of budding gymnasts. Hybrid courses that blend gymnastics with sports skills and athletic conditioning offer an excellent opportunity for team sports athletes to stay in shape during the off-season, while our strictly gymnastics courses improve balance, flexibility, strength, coordination, and confidence. All of our school age classes cater to a variety of skill levels from beginner to competition tier. This class is designed for girls ages 5-6 years old and is a good fit for new students and former Blazing Stars alike. Coaches focus on the individual capabilities of each student while introducing new gymnastics skills using progressions and developing a solid foundation of gymnastics fundamentals including cartwheels, handstands, forward and backward rolls, and bridges. Fitness skills, strengthening exercises, body awareness activities, and healthy habits are all introduced and reinforced throughout the year. 60 minutes. This class is designed for girls ages 7 and up and is a good fit for new students or former Core Stars alike. The objective of the course is to build a foundation in gymnastics skills using progressions for cartwheels, handstands, bridges, and pullovers. Strength, flexibility, balance, coordination, and confidence are all reinforced through physical conditioning exercises. 60 minutes. This class is designed for girls ages 9 and up and is a good fit for new students or former students alike. The objective of the course is to build a foundation in gymnastics skills using progressions for cartwheels, handstands, bridges, and pullovers. Strength, flexibility, balance, coordination, and confidence are all reinforced through physical conditioning exercises. 60 minutes. This class is designed for girls ages 11 and up and is a good fit for new students or former students alike. The objective of the course is to build a foundation in gymnastics skills using progressions for cartwheels, handstands, bridges, and pullovers. Strength, flexibility, balance, coordination, and confidence are all reinforced through physical conditioning exercises. 60 minutes. Designed for boys ages 7 and up, this class combines skills from gymnastics with traditional sports conditioning to increase strength, coordination, balance, and agility. Boys can expect to learn progressions for handstands, cartwheels, pullovers, and forward and backward rolls as well as improve overall strength and conditioning through various gymnastics circuits. This is a great opportunity to keep young athletes in shape during the off-season, or to introduce fitness fundamentals. 60 minutes. 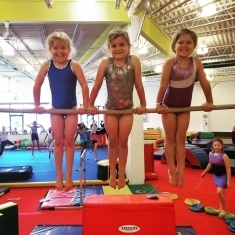 This intermediate level gymnastics class requires an evaluation by CORE coaches. Minimum skills required to join include bridge, handstand, cartwheel, and a pull-over. 90 minutes. Enrollment for this advanced level gymnastics class requires an evaluation by CORE coaches. Minimum skills required to join include-- FLOOR: handstand, handstand forward roll, back walk over, round-off, 1 arm cartwheel, back handspring, leaps; BARS: pullover, glide-swing, long-hang pullover, squat on low bar, back hip circle, mill circle; BEAM: turns, leaps, cartwheel, lunge handstand, round-off dismount; VAULT: squat over, straddle over, handstand flat back. 120 minutes.